The real beauty but also the efficiency of Baguazhang as transmitted by Dong Haichuan are requesting the correct applications of Pre-Heaven and Post Heaven Bagua (Eight Trigrams) principles: applying Pre-Heaven Bagua principles require an exocentric circling from a center while Post-Heaven principles require a concentric circling to a center. Baguazhang Martial artists who are following this way will then be unparalleled fighters and execute divinely their forms. But of course their martial skills and mastery of movements are just the logical results of body and mind conditioning. One amazing skill is the ability to respond to any situation with an infinite combination of palms techniques which inspired from a determined set of basic palm techniques. This is in pure application of the Yijing theory where myriads of thing are progressively generated from a unique cell. Baguazhang Palms are following this same way of development: from its eight (8) basic (also called Old) Palms it will generate a total of sixty-four (64) palms. Baguazhang is meant to be a physical manifestation of the trigram properties (Gua in Chinese); this martial art style emphasizing the applications of the open hand. Though for hitting, the fist and feet are also used---in fact, the whole body is used. This art can tune itself with any situation, but cultivating this skill requires commitment. Most Baguazhang techniques originated from other Northern Chinese systems. But its main contribution was its circularity and evasive footwork. Employing the strategy of change, it is a circular style utilizing body turning and twisting movements. The footwork, coupled with the logical body mechanics and ingrained patterns, allows the martial artist to set up and execute techniques while rapidly changing movement, direction and alignment. Thus, the trigram artist learns to be cunning and adaptable. As a bonus, body energy is reserved via the decreased amount of the muscle power needed to defeat opponents. Solo exercises are particularly important as they are used to condition the beginner in maintaining alignment and focus while in motion. Later forms will help develop to use the power of whole body behind every movement. They will also convey these principles into another level. Progression to partner training exercises familiarizes the student with physical contact, putting theses principles to work. The energy cultivated is flexible, resilient and elastic. - Post-Heaven Bagua combined in the form cultivates the martial spirit of the practitioner and eases his expression of internal power. The ones who just train the form (Post-Heaven Bagua) called generally in Chinese martial arts “Hua Quan Xiu Tui” (Flowering fists and weak legs) will lack of decisive martial power and even general balance in each posture. Then both cultivations are required: deepening your mental, increasing your internal power, form and mind simultaneously developing are the essential steps in authentic Baguazhang. The internal training in Pan style Baguazhang is one of the most important of parts of its training emphasizing in the proper development of Yi (Intention), Qi and Shen (Spirit). Baguazhang is in fact a body mind method to develop one’s overall potential. In full accordance with Chinese Traditional Medicine principles it will increase Qi and blood circulations in the body natural vessels catering any smallest parts of it and evacuating naturally perverted chemical substances. For this reason combat applications and forms as external practice are the other important part that should not be neglected, extending and materializing this new level of achievement of the practitioner, he will then be able to correct further each component of his new abilities, amplifying where its is still defective and moderating where it is too excessive everywhere in the body. Stillness techniques in internal cultivation for spirit and Qi accumulation have proven beneficial regulating effects on Qi and blood, through energetic meridians and blood vessels. Stillness and dynamic exercises have their own advantages but also their own limits and should be balanced just as Yin and Yang should be appropriately balanced. So practice shape not leave spirit and mind, practice spirit and mind not leave shape quality, shape and spirit should combine one, dynamic and stillness should have limit, Yin and Yang should appropriate. If your mental is not adjusted then Qi will hardly condense and will disperse disorderly, if body not adjusted then Qi will hardly penetrate deeply the form itself, if your breathing is not correct then you will hardly gather your internal power and of course unable to develop it. If your mental is not dispersing all around, Qi will naturally gather inside your body, if your spirit is invaded by random your internal power can naturally gather by itself and reach a higher level of development. When you are gathering Qi then you are nourishing your blood and your bones, therefore strengthening muscles and tendons which will definitively be perceived in each of your movements: you reach an incomparable melting of beauty and perfection. Mental driving Qi during Baguazhang exercise is a key feature in internal cultivation and moreover in healing or health preservation as it will help to purify Qi itself, separating it from the turbid Qi originated from pathogenic or external factors we are perfect coherence with principle of Yin and Yang. Baguazhang internal cultivation is comparable to other alchemic Taoist cultivation: the aim is to stimulate the Qi up to a certain level in order to let release his multitude facets, then it will merge with the form and strengthen the muscles of the practitioner. 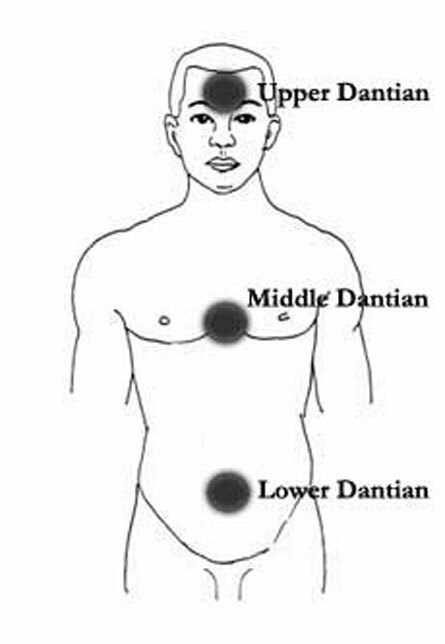 According to ancient Chinese human body has three Dantian, the Upper Dantian is supervising all Qi’s maneuvers in the whole body, the Middle Dantian is the logistic center where Qi is dispatched in the body, the Lower Dantian is the place where Qi is cumulated and prepared for the special Heaven circulation. In ordinary human body Qi is mostly sunk in the chest level and has difficulties to descend and move in lower levels, as a result the lower limbs cannot be solidly rooted to the ground and the lower abdomen not substantial. Besides the lack of balance that it results the absence of Qi in Lower Dantian makes impossible for the practitioner to step with suppleness while firmly rooted and to burst out an exploding inner power. The request of lowering Qi in Lower Dantian is the very first and important of mastery in Qi cultivation. Mr. Ao Qinghai teaches Pan style Baguazhang where stillness exercises are a very important part of their training program: each fist and palm technique has its corresponding fixed. It is believed that post standing combined with mental induction will build the first concrete step of internal and external cultivation. Post technique and Xinfa’s main point combine to proceed internal and external cultivate. For an external observer post standing may be perceived as fully static or uninteresting but once we made the first step in this internal work, we will understand that it requires a very fine adjustment to have body and power correctly positioned and solicited, without excess, relaxed but not slacking, mental focused, active but not contracted, expanding but in the same time condensed internally, eyes looking forward, like able to see very far but in the same time very conscious of close objects, inside your body you will like a large spring compressed ready to stretch out, as a result your body is erected and you reach a very bright spirit: an exquisite beauty of your movements while inside your Lower and Middle Dantian are stimulated and fully interconnected.